WINNIPEG — Quebec Conservatives will rally next week in the riding just vacated by longtime Tory stalwart Denis Lebel. 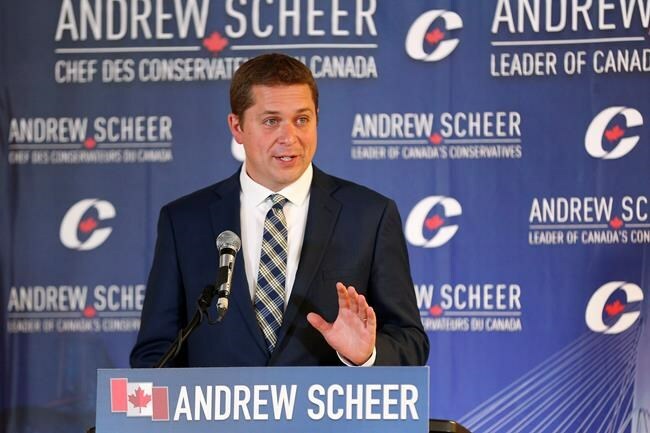 The byelection there will likely be an early test for new Conservative Leader Andrew Scheer and could be a tough one to pass: Lebel won Lac-Saint-Jean in 2015 with just 33 per cent of the vote. The byelection must be called by February, but Conservatives are already thinking ahead, talking election strategy on the final day of their fall planning meetings. Quebec isn't the only campaign on the horizon. Interim Conservative leader Rona Ambrose's seat is empty in Alberta. Saskatchewan Conservative MP Gerry Ritz and former Liberal cabinet minister Judy Foote from Newfoundland and Labrador both recently announced their retirements. Those three are considered secure holds for their respective parties, but Quebec could be a competitive race. So after a group of Quebec Tories gather there next week, expect to also see them on the ground there often in the coming months. Their candidate is Remy Leclerc, a former social worker who spent the last decade working for Lebel. On Thursday, the Liberals nominated a popular local mayor, Richard Hebert. "It's a riding that's important for us to win," said Quebec Conservative Maxime Bernier. "We're only 11 MPs in Quebec, we need to be more members of Parliament from Quebec if we want to win the next election." The party elected 12 MPs in 2015 — including Lebel — their best showing in the province under former leader Stephen Harper. It came largely at the expense of the collapse of support for the New Democrats, with Tories picking up seven of their seats. Lebel's narrow finish in a riding he'd held for 10 years, however, was also due to a drop in NDP support and a consequent boost for the Liberals. The pattern of NDP votes going to the Liberals repeated itself over and over again in the 2015 election and in some places cost the Tories seats. Conservative deputy leader Lisa Raitt said the smaller NDP vote in Atlantic Canada, as well as in the Toronto-area, were factors for her party's reduction to Opposition status. The party analyzed results like that across the country during their morning session Friday. But just as Prime Minister Justin Trudeau is irritating former Conservatives with measures like a review of the tax code, so too will he have to address the former New Democrats who came his way, she said. "Mr. Trudeau has broken a lot of promises those NDP voters counted on and he'll have to atone for those as well," she said. An unknown for the Conservatives, however, is who the New Democrats will select as their new leader next month. Deepak Obhrai said he gave his fellow MPs an assessment Friday of the potential impact of candidate Jagmeet Singh. Obhrai called him a divisive figure in the Indo-Canadian community. "If he does become leader, which I'm not sure, then there is a very big potential of many Jack Layton-type NDPers looking for a new home," Obhrai said. "That's support we have to look into." Conservative Gerard Deltell says he knows NDP candidate Guy Caron well, because the two have both served as finance critics. While he's not offering an endorsement, he said he thinks Caron has been running a good campaign. "We do not select our opponent, we fight them," Deltell said. "Let them select who they think is the best leader and we will address it."